The Australian Egg Corporation was fond of the tag line "It all starts with an egg." After breaking a world record for balancing eggs in college, Brian Spotts posted a few pictures on his web group and went about his life. He moved back to Colorado, got a job, and married a massage therapist named Stephanie. They had fun and did silly things together, and they started a family. In September 2005, a few weeks after their first son was born, Steph called Brian at work to read him an email he had received. 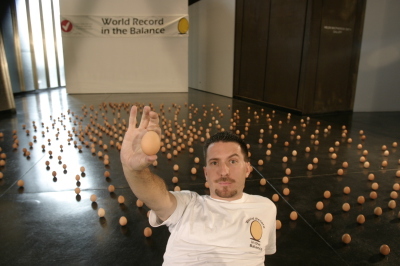 It was apparently from a lady in Australia who said she was interested in breaking a world record for balancing eggs. It took a few emails and a phone call to convince Brian that it wasn't a hoax. It turned out that she was a public relations representative working for the Australian Egg Corporation. 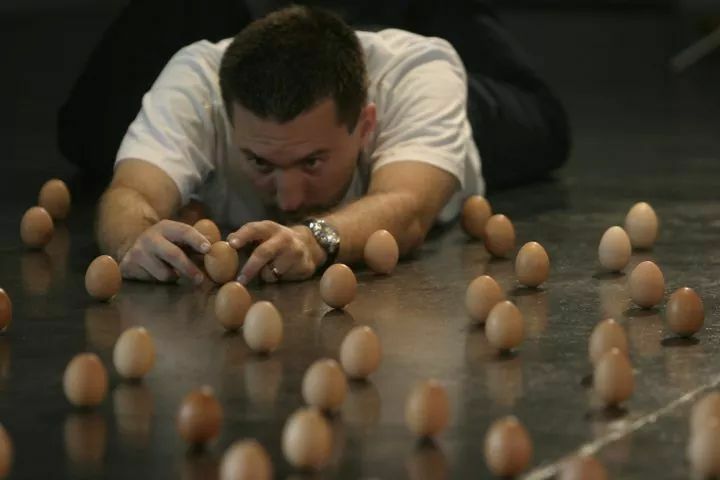 They wanted to do a publicity stunt for the National Heart Foundation giving the egg its "Tick of Approval" as a heart-healthy food..
A few weeks later, Brian traveled to the Australian Centre for Contemporary Art in Melbourne, and broke the world record for Most Eggs Balanced Simultaneously by an Individual (439 eggs). He also invented a new category: Fastest Time to Balance a Dozen Eggs, which he did in 4 minutes and 2 seconds. That's when the Associated Press got a hold of the story, and The Egg Man became world-renowned. There were cameras and news reporters and radio show interviews. All of a sudden, Brian Spotts was appearing on news sites and blogs in every language, laying on a black floor balancing brown eggs in Australia. Ripley's Believe it or Not published 3 different books mentioning Brian Spotts. Who would have thought that balancing eggs would lead to this? But it was only the beginning.